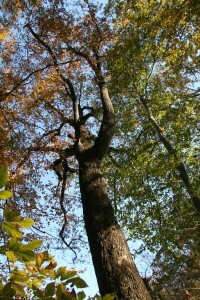 Although common on dry, rocky soils, chestnut oak grows best in well-drained coves and bottomlands. As with most white oaks, its growth is slow on almost all sites. It can form pure stands on poorer sites of hillsides and mountain slopes, but is most often mixed with other species such as hickories, other oaks, and even pitch pines. The tree is a source of tannin, which can be used in the making of leather goods. Chestnut oak leaves are deciduous, roughly-oval but often wider near the apex, and roughly-toothed. The shiny acorn is 1 to 1.5 inches long.